Remember when that pack of slavering corporate lawyers went after a helpless World Nutella Day, hounding it through the woods and nipping at its heels, trying to silence its delicious message forever? Hush now, that was aaaaall a bad dream, since Ferrero has called off its ravenous legal team and decided to let World Nutella Day live on. We were scared too, not knowing why anyone would want to shut down a celebration of something so delicious. The founder of World Nutella Day dismayed fans earlier this week when she announced that the annual Feb. 5 event wouldn’t happen and that she’d been ordered to take down her site, after receiving a cease-and-desist letter from the Ferrero overlords. I’m relieved to say there’s been a positive resolution to the situation. Ferrero employees reached out to me directly after I had posted my fan letter online and sent my formal reply to their C&D. They were very gracious and supportive and we were able to have a productive discussion about World Nutella Day living on for the fans, which is the whole point. I believe they were truly interested in resolving the situation in a way that preserved the spirit of the fan-run holiday. 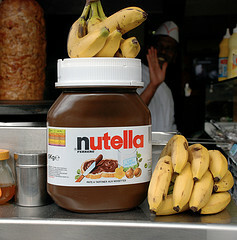 I’m satisfied with the turn of events, and I hope to celebrate many more World Nutella Days with you. See you on February 5th! We’ll be there with bells on. Bells filled with Nutella.